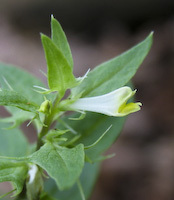 Distinctive features: Tubular white flowers, yellow-tipped. Small plant. Flowers: Summer; White, Yellow; Irregular flowers; Tubular white, yellow-tipped. Small, only about 1/2" long. Leaves: Opposite. 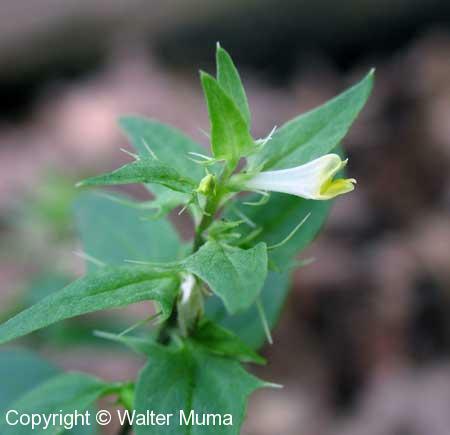 Often the upper leaves have a few pointed teeth. Habitat: Forests; Open dry woods, bogs. Photographs: 40 photographs available, of which 5 are featured on this page. SCROLL DOWN FOR PHOTOGRAPHS. The tubular flower of Cowwheat. It is only about 1/2" long. 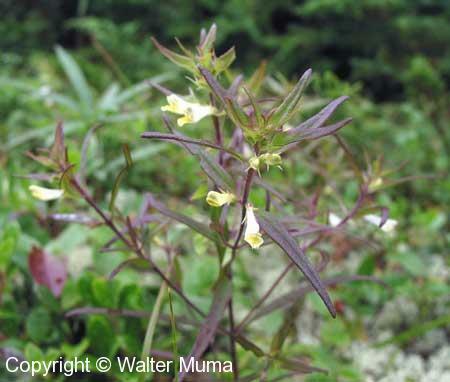 Some Cowwheat plants have more regular-shaped leaves. And sometimes the leaves are narrow.